Standard Broadband is currently constructing our Fibre To The Home network in several communities. Below you will find answers to some of the more commonly asked questions. We also maintain a construction update page for each community that is updated on weekly basis with more specific details for each project. Should you have any questions or concerns please feel free to contact our construction hot line at 1-866-304-9117 or via email ftthconstruction@standardbroadband.ca. Alternatively you may complete the contact form on this page. Before any construction begins in a neighbourhood a letter will be circulated to the homes outlining when work will commence and any other specific details. Along with a letter 36″x48″ signs will be placed around the streets with our contact information should you have any questions. While we are likely the most prominent construction in the area it as we bring out network to your street it should also be noted that we are not the only infrastructure provider working in the areas. Hydro, Gas and other providers are also performing installation and repair work. If you see locate flags or paint markings in your area and do not see information on our site pertaining to work being conducted feel free to contact our construction hot line and we can quickly advise if we have any work planned in the area. Will there be work done on private property? No construction will happen on private property. During our Fibre To The Home network construction work will be conducted under a muncipal consent permit. The permit allows for work to be done only in muncipal property and as outlined by the engineering drawings assosiated with the permit. No work will be conducted on private property without first obtaining express permission from the property owner or where the town has obtained an easement for the work being conducted. Our Fibre To The Home network consists of our backbone infrastructure and end user connection infrastructure. The backbone infrastructure consists of 38mm or 50mm orange ducts that are placed in the ground along the boulevard and muncipale right of ways. These ducts are placed in the the ground at a typical depth of 1m and located between the property line and the end of the road. The exact location will vary based upon other underground utilities. 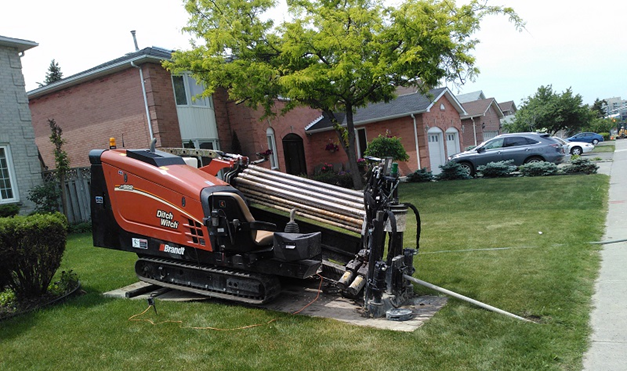 Ducts are placed underground using either Horizonal Direction Driling where a drill such as the one below is used to create an underground path between two points without the need cut open the surface above. 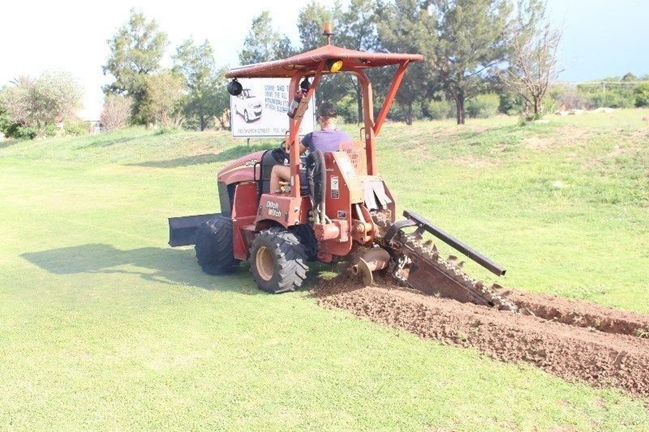 At times ducts are also placed in the ground using an open trench. The trench is backfilled immiadately after the duct has been placed in side of it and the surface is restored when construction has been completed. Below is an example of an open trench. The ducts are run to underground vaults also known as ground level boxes. These boxes serve as connection points where customer service drop wires are connected to the backbone network. Customer service drop wires are run from each vault to single homes and are placed in the ground 8-12″ at the time of installation. What are these green boxes located around the area? You may notice that green boxes such as the one below have been placed in the area. These boxes act as a point for connection between the backbone fibre network and the individual homes that are connected. Typically one box will connectio 4-6 homes. The boxes are known as Vaults or Grould Level Box (GLB) and are installed flush to grade. 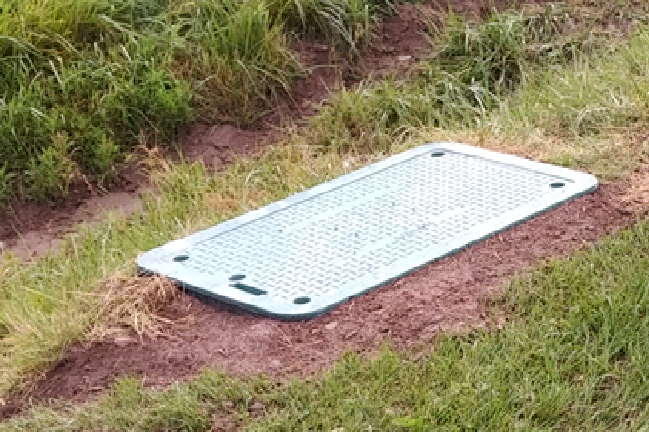 While not always possile we do our best to place these boxes in common locations where existing infrastrucuture exists such as where an existing hydro transform is located. What are these flags and paint markings on my driveway and boulevard? The flags and paint markings you may see around your property are locate markings. These markings indicate where existing underground infrastructure exists and are marked / flagged by the owner of the infrastrucutre. Locates are required prioer to any construction commencing upon completion of work our team will remove all flags. The paint used will wash away and leave no perminant markings. Construction took place on my boulevard who will repair the area? During construction our teams will be working in areas of the boulevard. Depending on the equipment used and work being conducted the area my become distrubed. Standard Broadband will restore all areas to the condition they were in upon completion of work in the area. Typically with-in 1-2 weeks from the completion of construction work. Why are there are wires on the surface of the boulevard? The black wire you may see along the boulevard is known as a service drop wire. This wire is used to connect a single home to our network and is run from the nearest vault or ground level box. The servie drop wire is normally run along the surface during installation and should be placed in the ground withing 48 hours after the installation. If you notice a cable that has been on the surface for more than a few days please contact our construction hot line at 1-866-304-9117 or via email ftthconstruction@standardbroadband.ca and they will ensure the wire is buried promptly. If a service drop becomes damaged or broken during the winter months and a new wire is run. Placing that new service drop in the ground may not be possible immiadately however our construction team will bury them as the ground thaws in the early spring.